This page is the reservation request form for restaurants in Ishigaki, Okinawa, Teppanyki Steak Ishida or Sumi-Yakiniku Ishidaya Ishigaki. 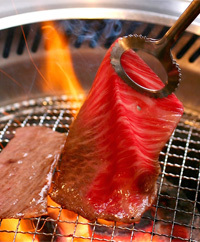 For those desiring a reservation for restaurants at Kobe Steak Ishida, in Kobe, please click here for reservations. To make a reservation at Yakiniku Ishidaya Ishigaki online, please purchase of a meal ticket below. The Lunch Time Meal Ticket is 3,000 yen per person and can be used for lunch only (11:30 a.m. to 3:00 p.m.). The dinner time meal ticket is 5,000 yen and is good for dinner only (3:00 p.m. to last order). Due to the high volume of reservations as well as overlap with other customers making reservations, we kindly request that customers secure a reservation by paying for their meal ticket with a credit card or PayPal before their reservation. After the meal ticket is purchased online, you can use it to order any food or drink at the restaurant. If the total amount of the bill at the restaurant exceeds the price of the ticket, the difference is to be paid after the meal. We look forward to serving you at our restaurant, and making your time at our restaurant, a special one. ---11:30 a.m.(Lunch)12:00 p.m.(Lunch)12:30 p.m.(Lunch)1:00 p.m.(Lunch)1:30 p.m.(Lunch)2:00 p.m.2:30 p.m.3:00 p.m.3:30 p.m.4:00 p.m.4:30 p.m.5:00 p.m.5:30 p.m.6:00 p.m.6:30 p.m.7:00 p.m.7:30 p.m.8:00 p.m.8:30 p.m.9:00 p.m.
To make a reservation at Yakiniku Ishidaya Ishigaki online, please purchase of a meal ticket below. Dinner Meal Ticket is 5,000 yen per person (dinner only 3:00 p.m. to last order). Lunch Meal Ticket: 3,000 yen per person (lunch only 11:30 a.m. to 3:00 p.m.). ※Additional orders for food and drink can be paid for at the restaurant.